Bone grafting by a Kent dentist is a surgical procedure used in dentistry to augment or replace the bone mass in a particular area; the bone grafting procedure can also be done in cases when the bone structure supporting the teeth needs to be altered in shape, in preparation for the placement of dental implants. When there is not enough bone mass present in a patient’s jaw area, it may be necessary to create new bone (or to encourage the regeneration of new bone tissue) to fill in missing areas, so that dental implants can successfully be fitted and placed. A variety of techniques are available to do this, and these techniques are collectively called, “bone grafting”. Bone grafting is deemed as necessary in cases when the patient does not have sufficient bone mass in the area where dental implants need to be placed. The bone grafting material will be placed by the dentist at Woodbury Dental and Laser Clinic onto the area that needs to be augmented or added to, so that the material can fully be integrated with the surrounding bone tissue; the end result is improved jaw bone mass, which can then provide sufficient support for the placement of the much-needed dental implants. Onlay Bone Grafting – Onlay bone grafting refers to the bone grafting technique wherein the grafting material is applied to either the side, or the top, of the patient’s existing bone mass. The onlay bone grafting technique is used by the dentist at Woodbury Dental and Laser Clinic in cases when the patient’s jaw bone has shrunk due to a long period of time without teeth (in that particular area). The bone grafting material will be given sufficient time to fully be integrated with the surrounding bone tissue, before the dental implants can successfully be placed in the area. 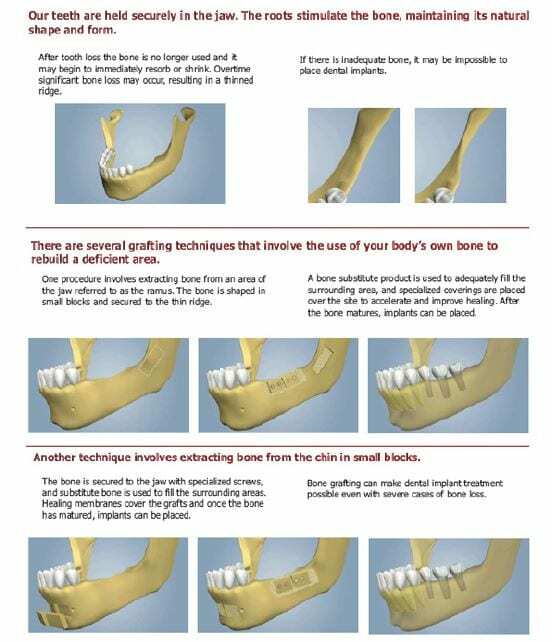 Block Bone Grafting – Block bone grafting is a technique that uses blocks of bone to improve the jaw bone mass of a given area. The block of bone grafting material is carefully measured, and even changed in shape, so that it can precisely fit the jaw bone area that needs to be augmented or improved. The grafting material is held in place by small bone screws, which will be removed once the block bone grafting material has been given enough time to fully be integrated with the surrounding bone tissue. Particulate Bone Grafting – Particulate bone grafting is a bone grafting technique by a Kent dentist that uses small particles of cortical or cancellous bone, which has the capability encouraging the quick integration and regeneration of the surrounding bone tissue; this translates to a shorter period of waiting time for the particulate bone grafting material to heal, and be ready for the placement of the dental implants. Where Do Bone Grafting Materials Come From? The bone grafting materials used in these situations may be specially treated donor material that can come from a bone bank; the grafting material can also come from a synthetic substitute, or taken from areas in the own patient’s mouth where there is some bone to spare. In special cases where more sizeable amounts of bone grafting material are needed, it is possible to move bone from other places of the patient’s own body (such as the hip or shin) to the jaw bone area where additional bone mass is needed. In clinical conditions that necessitate a bone grafting procedure by the dentist at Woodbury Dental and Laser Clinic to increase the amount of bone to support the placement of dental implants – the period of time needed for the whole dental implant procedure to be finished is generally lengthened. Under routine circumstances where no bone grafting is required, the dental implants are commonly ready to function after 3 to 6 months after the implants placement. If the bone grafting procedure can be done at the same time the dental implants are placed, treatment will more likely take 6 to 12 months. Where implant placement must be delayed until after the bone graft is allowed a period of integration with the surrounding bone tissue, the overall treatment may take 12 to 18 months. 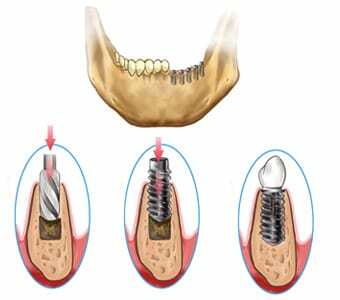 A technique called ‘guided tissue regeneration’ has also shown considerable success, in cases when the amount of bone at the intended dental implant site is not enough. When a tooth is removed, a hole in the gum and bone remains for the first few weeks. Anyone who has lost a tooth or had an extraction knows that this generally heals uneventfully, and eventually you cannot tell where the tooth was.